I'm no spring chicken or cutting-edge technology adapter, but I seem like one next to my mother-in-law, who lacks a working computer or Internet connection. She used to have one, but never really got the hang of it. She's definitely not going to start now, when she's pushing 90. Last night, Megyn Kelly of Fox News played a clip from a viral YouTube video featuring a wedding in which the Irish tenor priest Fr. Ray Kelly sings a so-so version of Leonard Cohen's "Hallelujah." This excellent song had been covered by all kinds of artists for years, and used in the movie "Shrek," before contemporary churches got hold of it and started incorporating it in services--after ditching the original, interesting lyrics and replacing them with anodyne sentiments framing the essential chorus of "Hallelujah." I couldn't feel, so I tried to touch. Does my mother-in-law want a nice, easy CD with a copy of one of the good covers of this song that are available commercially? No, she likes Father Kelly's voice on the wedding video. (So does everyone; the YouTube video has gotten 30 million hits in a few days.) Probably she also gets a kick out of the unexpected sight of a priest breaking into song from the altar, and the delighted couple smiling shyly. Sigh. There's no question that we'll do whatever it takes to provide her with this small pleasure; she's ill and in constant discomfort these days. But it turns out to be unexpectedly complicated to put a YouTube video into a format that one's TV can play, because absolutely no one does that any more. This site offers advice about two separate pieces of freeware, one to download the video and another to burn the DVD. The very first comment notes that the freeware doesn't work, but recommends two other programs that do. Succeeding comments complain that the second recommendations bristle with malware; others disagree; and others point out that they don't work on Macs. It would almost be easier to buy her a computer and an Internet connection, but it's all she can do to operate the TV, so that's not in the cards. I'm hoping some of you will know better than I how to pull this off. Or that, in the meantime, my delightful husband figures it out. I can hear him cussing in the other room right now. My Holy Week reading has included that old standby, "The Screwtape Letters." The senior tempter Screwtape explains to his feckless nephew that the "Enemy" wants men to be concerned with what they do, while the tempter should try to distract his subject with what will happen to him. All our recent talk about insurrection brought to mind this clip from the fine movie "Matewan." Most of the townspeople were uneasily watching an eviction, thinking about what was happening to them and their neighbors. The sheriff thinks about what he will do. Holy Saturday is Jailbreak Day. The suffering of the Crucifixion is over. Christ has descended into Hell, opened all the cell doors, and showed everyone the way out. "Follow Me," He says. "You know how to put one foot in front of the other." It's about what we do, not what happens to us. A thousand years ago, Brian Boru died at the Battle of Clontarf. For a long time Irish historians taught Clontarf as the victory by which the Irish freed themselves from the Vikings (as, this being the real point of the lesson for their students, one might hope the Irish might someday free themselves from a more recent ship-borne foreign invader). Thus Brian Boru was a major historical figure in Ireland, a patriotic icon of significant standing. In fact, of course, there were nearly as many Vikings on Boru's side as against him. What he was really doing was entering into Viking politics, with the result that an alliance was formed that improved outcomes for his side. The Irish were more important, and better off, but they didn't push the Vikings into the sea. Nevertheless, he was a revolutionary figure. Before him the Ui Neill -- the family, that is, of the same Neil of the Nine Hostages who once enslaved Saint Patrick -- had dominated the High Kingship of Ireland. After him comes one of the most famous family names in Ireland: the O'Brians. Children are gifts from God, but this time it appears that the inability of Congress to craft a budget may have had some influence. Pretty teenage girl to rescue. You can never have enough giant robots. It would take a heart of stone not to chuckle at the White House's recent squirming over the results of having "disparate impact" reasoning used against them in re their practice of underpaying female staffers. Now the same amusing spectacle is playing itself out in a lawsuit by the EEOC against Kaplan, Inc., the private test-prep and for-profit education company. The Sixth Circuit recently poured out the EEOC's complaint that Kaplan was using the same background checks on prospective employees that the EEOC itself uses. The EEOC had argued that criminal record and credit checks had a disparate impact on minority applicants. Can you imagine Kaplan trying to defend itself against a suit by customers whose financial information was stolen by Kaplan employees with access to their student loan records? "Yes, we could have run routine background checks, but that might have been unfair to minority applicants." How can anyone even argue with a straight face that it's racially discriminatory to consider criminal and credit records for prospective employees? What mental gymnastics are required to ignore the implications of that assumption? It does seem like the Right spends a lot of time worrying about whether the individual involved in the case is really the right kind of guy, really respectable and really just our sort. The Left doesn't do this, which is probably why they win a lot more of these fights. As Steyn points out, though, it's getting to be common enough that they can't all be bad apples. * In California, Mozilla’s chief executive is forced to resign because he once made a political donation in support of the pre-revisionist definition of marriage. * At Westminster, the House of Commons Science and Technology Committee declares that the BBC should seek ‘special clearance’ before it interviews climate sceptics, such as fringe wacko extremists like former Chancellor Nigel Lawson. * In Massachusetts, Brandeis University withdraws its offer of an honorary degree to a black feminist atheist human rights campaigner from Somalia. * In London, a multitude of liberal journalists and artists responsible for everything from Monty Python to Downton Abbey sign an open letter in favour of the first state restraints on the British press in three and a quarter centuries. * And in Canberra the government is planning to repeal Section 18C — whoa, don’t worry, not all of it, just three or four adjectives; or maybe only two, or whatever it’s down to by now, after what Gay Alcorn in the Age described as the ongoing debate about ‘where to strike the balance between free speech in a democracy and protection against racial abuse in a multicultural society’. The question, at some point, ceases to be about the merits of the individual case, or whether we do or do not care for the individual in conflict with the government. The first people to come into conflict with an increasingly oppressive system will be the most pricklish, and often we don't care for the pricklish. What we call the 'merits,' though, are about the law as it stands. If the system is the problem, the law that the system interprets is untrustworthy as a guide. For now it's the pricklish, or the outlandish, or the self-righteous. Or maybe it's the self-described outlaws. But increasingly, it's all of us. If we're going to have to fight, why wait until there are fewer of us left? Nice Work, NYT: "Veterans and White Supremacy"
Don't you folks ever worry that if you keep calling people racists and white supremacists often enough, the words will lose their sting? What happens if that happens? Kevin Williamson's piece inspires me with the view that "there is a great deal of real estate between complete submission and civil war, and that acts such as Mr. Bundy’s are not only bearable in a free republic but positively salubrious." What's more, it can't be a good idea for the federal government to own 87% of Nevada. At the same time, Bundy looks like one of those people who have lived next-door to a vacant lot for so long that they've come to think of it as their private park, and are aggrieved when a Walmart gets built on it—though they'd never dream of forming a consortium to save up money, buy it, and preserve it in its wild glory. After I go through all that, I come back to a profound contempt for Harry Reid that leads me to cheer for anyone who puts a stick in his eye. [T]his is a nation with a “government of laws and not of men”—and not the other way around—and it seems to me that this principle should not be considered null and void because one of those men happens to have an agreeable tale, a photogenic complaint, and a romantic genealogical past. . . . Are we really to believe that the government’s backing up its rules with force is unique to Obama? 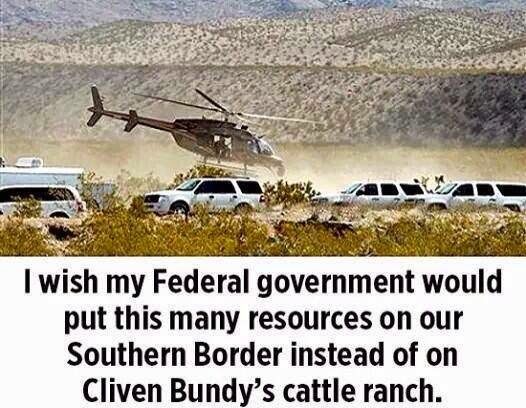 And why would we imagine that Bundy would have a chance if he doesn’t have a case? . . . “Mr. Bundy’s stand should not be construed as a general template for civic action,” Williamson writes, thereby demonstrating the problem rather neatly: When you change the government, you do not need to worry about setting a precedent; when you merely disobey it, you are setting yourself above a system that remains in force. . . . When can one refuse to obey the law without expecting to bring the whole thing down? The Census Bureau announces that, by sheer coincidence, its household survey questions about health insurance status will be so radically changed this year that it won't be possible to determine how much of the change in status resulted from Obamacare and how much from the new form of question. Sorry about that, guys! I guess they figure they can continue to squeak out votes of over 50% of the population without relying on anyone with a brain. I've been in the bleak north for a good part of a week, and made the return crossing of the Mason-Dixon line last night. I will be in the DC area for a few days, if any of you who dwell in those regions are interested. Terrific animation of the operations of a cell at the individual protein level. There's an ad at the beginning, but you can skip it after the first annoying five seconds.